So, maybe you’ve been focusing on living a more clutter-free life. Maybe you want to pass on this lifestyle to some of the important men in your life. Clutter-free gifts are a memorable way to stand out in any gift-giving season. A clutter-free gift is often something that isn’t tangible. It’s something that the recipient can use and create memories using. Sometimes they are something that is consumable or even gift cards. The idea is to keep clutter out of the home. 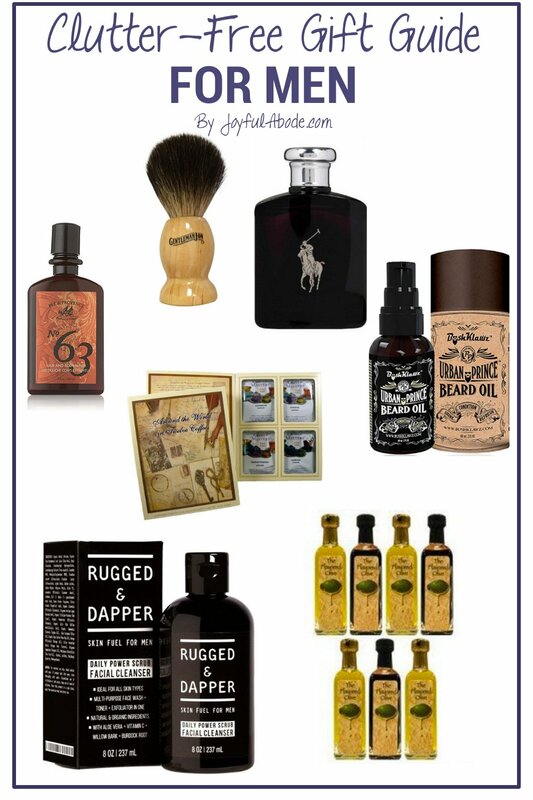 If you’re looking for clutter-free gift ideas for men, you’re in the right place. Let’s see what you can use to surprise your husband, brothers or adult children! Have you ever considered a monthly subscription as a gift? They’re gaining more and more traction as they become more popular. With services for entertainment and even daily needs, there are many different options for the men in your life. Here’s just a few to get started! Netflix – You can’t go wrong with a Netflix subscription. With all of the wonderful Netflix originals, this is an awesome gift for almost everyone. You can pick up a Netflix gift card here! Dollar Shave Club – They deliver quality razors and other shaving products right to your gift recipient’s door! You can choose from e-gift cards or their packages. Check out the Dollar Shave Club here! Man Crates – A relatively new service, Man Crates is one-of-a-kind! They offer all kinds of different crates and themes – including a microbrew crate and a survival crate. The coolest thing about Man Crates is that the man you send it to will have to open the wooden crate themselves with a crowbar that’s sent along with the crate. That’s pretty memorable! A lot of the men in my life spend a lot of time outdoors fishing, hunting, and camping. If your guy can relate to this, then these gifts are a great place to start. Fishing License – You may even consider throwing in some fishing essentials like hooks and non-perishable bait. Hunting License – Including ammo, and maybe a nice new camouflage coat. State Parks Pass – Especially if he enjoys camping or hiking! There are a ton of options for memberships that most men will enjoy. Tickets to a lot of events are getting cheaper every year it seems. Here are some to get started with! Season pass to ski resort close to home. Season pass to their favorite local college football team’s games. Tickets to his favorite band. A manicure or pedicure – there are plenty of men who enjoy this! A membership to their favorite gym. A membership to movie clubs for local theaters. A day pass to their favorite museum – bonus points for including the whole family. A gift certificate for a full massage. Everyone loves food and most people have a favorite drink they enjoy. You can’t go wrong with consumable gifts – especially if they’re something that he can use and enjoy just about every day! A selection of gourmet wines for cooking or drinking. A collection of his favorite liquors. Different cooking oils like a collection of olive oils. A sampler basket of gourmet coffees – everyone loves coffee. Craft beers or even local IPAs. Most men take their grooming very seriously. They like to be clean and smell good. Whether it’s facial hair care or general hygiene, men like to look great. Here are some really great ideas to help any man stay nice and tidy. Exfoliating and moisturizing face wash. Beard oil to help grow a respectable mane. Shaving foam and a nice brush to apply it. You seriously can’t go wrong with gift cards. Especially if the man on your shopping list wants material things. Gift cards will let him get whatever “stuff” he wants. I’ll include quite a few here, so there should be at least one for every kind of person you’re shopping for! Staples gift card – for the home office entrepreneur. Restaurant gift card – the whole family can benefit from this. Cabela’s gift card – for the hunter, camper, and fisher in your life. Best Buy gift card – perfect for the techie who needs to have the latest technology. Apple gift card – help them get the newest iPhone or Mac. Maybe even a nice accessory for a product he already has. I hope this list gets you started on some clutter-free gift ideas for the men in your life. I’m sure that I’ve missed some ideas for gifts, so, if you have any other great ideas to add to this list, drop them down in the comments! I’d love to hear from you. Have you also started to pick up on the clutter-free gift trend? It’s gaining more traction every year as people commit to a minimalist lifestyle. These clutter-free gifts for men are sure to be a hit at Christmas, birthdays, and other gift giving occasions! Thanks for stopping by!